Creating digital solutions that elevate the customer experience through research, strategy and design. With woven-in sensor technology now you can feel the difference. Nadi X is a line of tights that communicate on the body to correct your form. Specializing in human/computer interaction, Wearable Experiments have created a language that allows the skin to become the interface using directional haptic feedback. 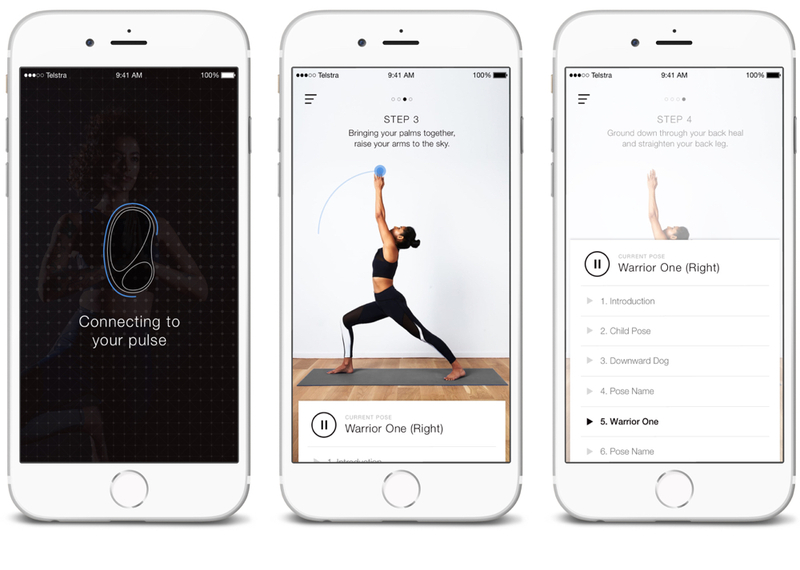 Haptic vibrations are built into a full physical language, allowing the technology to communicate feedback to help correct your form and achieve your wellness goals. The frequency and intensity of each vibration changes based on the body position and angle. Blockbuster is a digital consultancy focused on the business of architectural innovation through Blockchain integrated solutions. Their amazing multidisciplinary team have created bespoke end-to-end solutions for a wide array of industries including education, agriculture, crypto, tech and telecommunications. The team at BB asked if I would help create a brand and website to share their unique story, approach and passion for great design and technology. With the Optus retail digital shopping experience you can quickly browse through all products and services Optus offers and create your own single or packaged plan. The experience is also integrated with the in store queuing system so you can quickly get assistance from an Optus customer service expert. This project has allowed Optus to remove the confusing and messy ticketing information that plagued the retail shopping experience. Good Work has one of the most effective career management programs ever created, combining cutting edge software and one-on-one sessions with a highly experienced career specialist. For the first time, there's a program which helps you find out where you want to go in your career, and then provides tools to get you on track...and stay there! With the latest research in neuroscience Good Work creates a tailored strategy from the ground up and provides resources based on your motivations, interests and goals. Feel the rush of the game with Fan Jersey. Become part of the excitement as every major play reverberates on your skin. Connected through your phone via Bluetooth, Fan Jersey lets you receive real time haptic vibrations so you can feel the excitement of every highlight in the game. The experience creates a fan to team connection unlike anything ever seen before - putting you front and center with the game. Unveiled at Super Bowl 50 in 2016, Wearable Experiments showcased Fan Jersey at the Clift Hotel in San Francisco. Get closer to contemporary art with the Museum of Contemporary Art Australia app. The MCA App brings together voices from across the museum, including curators, artists, gallery hosts, and young guides. You’ll get more out of your MCA visit with exhibition and artwork guides in text, video and audio and find out more about the artists and artworks from the permanent collection that's on display. If you're at the MCA, connect to the free wifi, make sure your bluetooth is on, and access more about the artworks and artists as you enjoy interactive exhibitions. Now you can pop into your local NRMA branch and renew your policy, make a payment or get CTP Greenslip & Registration in minutes. You can also download the free NRMA mobile app for iOS and Android and do the same straight from your mobile. The NRMA Insurance app has been redesigned with you in mind. Simply log into the app using your policy details to have instant access to your policy information. You can personalise information by naming your policies, uploading photos and create a personal profile by adding your own profile picture in the side menu. Also, our handy reminder alert means it’s easy to renew your insurance quickly within the app. At your fingertips is helpful information like how to make a Claim, Contact Numbers and a Branch Finder, plus you can get quotes for Car, Motorcycle, Scooter, Home, Contents and Landlord Insurance which can be retrieved later. There are also useful videos about Insurance products as well as interactive safety tips such as how to keep your home safe while on holiday. The new NRMA responsive website gives customers a seamless experiences across platforms and devices. Allowing users to start a task (e.g Quote or Claim) on one device and easily pick up where they left off using another device. Extensive research and testing was completed to understand customer (current and prospective) needs and identify key features that should to be easily accessible from the homepage. A quick link task bar was created to highlight the most heavily used features, followed by the most popular products just below. Given the research found repeat visits low, the aim was to surface over 80% of the highest use cases, mitigating the need for navigational menus.